If your goal is to drive a vehicle that has arguably greater environmental friendliness than a Prius, but you want to look like you're driving pretty much the exact opposite of that, you're in luck. 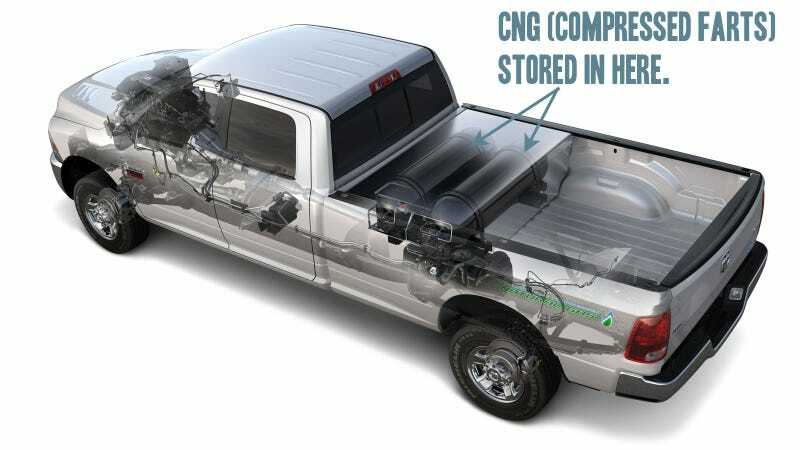 For the first time, a North American manufacturer is making a Compressed Natural Gas-powered vehicle right in the factory, and that vehicle is the huge 5.7-liter Ram 2500 Heavy Duty CNG. Sure, we've all driven in CNG cabs and buses and crammed in boxes in UPS trucks, but right now almost everything someone without a "route" can buy — Civic GX aside — in the U.S. has been converted to CNG power after manufacture. That's not the case here, and the tight integration of CNG and gasoline fuel systems makes that very apparent. The truck has two 130 liter CNG tanks (18.2 gallon equivalent) and one 8 gallon gasoline tank, giving the truck a total range of 367 miles. The two fuel systems can operate seamlessly: there's no switch or anything for the driver to worry about. Aside from a bit of gas to start, the truck runs on CNG until it swallows the last of it, then seamlessly switches to the gasoline tank. Easy. CNG is a great fuel, and this is a great step to using it more often. It's the cleanest burning of all hydrocarbon fuels, it's totally renewable, and in America, where only about 1% of vehicles actually run on the stuff, we produce 98% of the natural gas we use. Plus, it's already being pumped to your house right now, so if you owned a CNG vehicle, a home refueling station is within the realm of possibility. The Ram 2500 HD CNG pickup has a slightly shorter bed to accomodate the CNG tanks (I think roof mounting would look cooler and free room, but there's probably some safety crap about that) but the truck performs and tows much like its gasoline-swilling brother: it can haul 1,580 lbs in the bed, tow 7,650 lbs, and push a snowplow or your homemade combine or whatever. It's a big, tough, working truck, and it just so happens to run on what are essentially compressed farts. No word yet on seat-mounted emergency refueling hoses. Ram Trucks also announced two other new truck variants, the Ram Tradesman Crew and Quadcab editions, both with a V8 and those nifty RamBox compartments.